Sugar Free Strawberry GelatinWith Sugar Free Strawberry Gelatin you can enjoy a low calorie snack anytime of the day or even night! 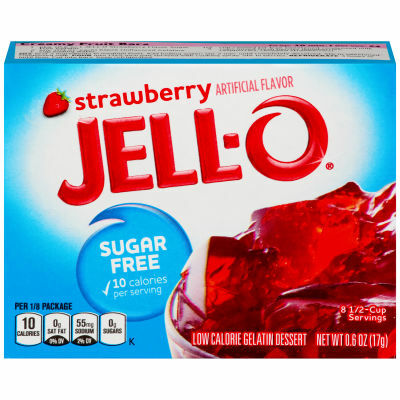 It is naturally fat free; you can add it in your salads to make it more fun and interesting.Satisfy your midnight dessert cravings with the guilt free Sugar-Free Strawberry Gelatin.Light As Air Yet Easy To Prepare!A vibrant, jiggly treat that everyone loves to eat as a snack or as a dessert! Layer it up with fruits or cake to make it more fun and fancy. Or mix it with fruit juices to make jiggly fruit drinks for the whole squad.No need to spend hours preparing desserts for a party when you can prepare jiggly jell-O desserts and jell-O drinks. Serving size 1/8 package (2.5g) (makes 1/2 cup).